The Country French side chair features a high shaped seat back and braided trim for classic dining style. An upholstered seat and seat back form a striking "L" shape wrapped in a beautifully patterned fabric that blends traditional tapestry and toile prints for an elegant look. Solid wood legs and a shaped apron feature subtle carved details that complete the timeless appeal of the Country French side chair. Upholstery is customizable with your choice of available fabrics or consumer furnished materials. 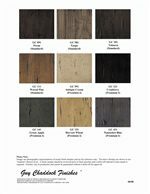 From the type of wood used in construction to the hand distressed finish that completes it, each product is expertly crafted and finished to your custom specifications for furnishings that truly reflect your style. Even the dimensions can be altered, for timeless furnishings that work seamlessly with space in addition to style. The end result is custom furnishings that not only fit your home, but also your lifestyle. The Melrose Custom Handmade Furniture Country French Dining Side Chair by Guy Chaddock at Design Interiors in the Tampa, St. Petersburg, Clearwater, Florida area. Product availability may vary. Contact us for the most current availability on this product. Finish Great care is taken to apply a unique, hand-rubbed finish to each piece for the finest finishes in the industry. 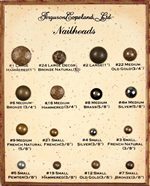 Each finish is comprised of multiple layers to achieve a deep patina effect. 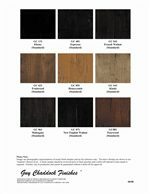 Color variations may occur due to the color, grain and texture. 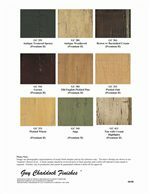 Finish & Paint Options From natural finishes that allow the wood grain to shine through to aged or weathered looks that lend an antique feel, an unrivaled selection of standard and premium finishes let you tailor each piece for a truly custom look and feel. Customizable Options Every piece is completely customizable, from wood type and dimensions to the finish that completes it. Upholstery is available in customer's own materials. The end result is custom furnishings that not only fit your home, but also your lifestyle. 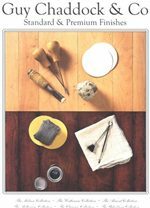 More than 50 years ago, a skilled craftsman by the name of Guy Chaddock began restoring antiques and crafting one-of-a-kind reproductions. 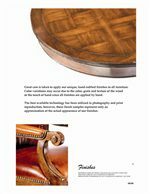 Fast forward fifty and some odd years and what started with a small group of skilled European furniture makers has grown into some of the finest handcrafted, solid wood furniture on the market today. 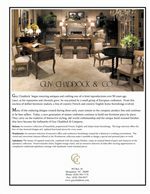 The Hand Made Custom furniture collection from Guy Chaddock & Company brings beautiful reproduction furnishings straight out of 18th and 19th century France, England and Italy and into the comfort of your home. Each bed, bench, table and chair is handcrafted and meticulously detailed using the company's original designs. 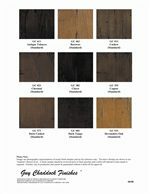 It is then customized with the hand applied finish of your choosing and lightly distressed using a chisel and ice pick for that authentic antique look. 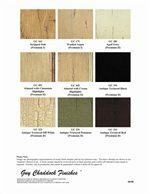 In addition, each Guy Chaddock & Co. product is made to order, and every detail from the type of wood used in creation to the finish, upholstery and nailhead or fabric trim that complete it is completely customizable with offered or consumer furnished materials. The result is timeless, one-of-a-kind heirloom furnishings that can be enjoyed for generations to come. 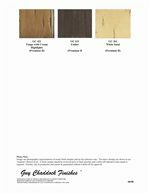 The Melrose Custom Handmade Furniture collection is a great option if you are looking for Traditional furniture in the Tampa, St. Petersburg, Clearwater, Florida area. Browse other items in the Melrose Custom Handmade Furniture collection from Design Interiors in the Tampa, St. Petersburg, Clearwater, Florida area.